The yearly official whale watching season opens between December and March in Riviera Nayarit. This year, these cetaceans are already starting to arrive. Marco squints his eyes and then points his finger towards an extremely smooth patch shaped as a giant foot on the surface of the ocean. "There's the trail", he points out. This could be the trail of a Yeti, only on the surface of the waters of Bahia de Banderas. Everybody onboard the Isis sailboat knows exactly what they're about to experience and can barely contain their excitement. They've been looking for these whales for over two hours with no luck, and the crowd is now completely silent. Suddenly, a small whale calf emerges, followed by its mother, and a common sigh can be heard before everyone exclaims in amazement. 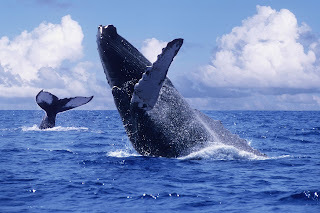 Every year thousands of humpback whales, the largest mammals in the world, visit Riviera Nayarit, offering an overwhelming show for those who have the chance to experience it. The official 2011 sighting season begins on December 8 and ends on March 23. The Environment and Wildlife Secretariat (SEMARNAT by its initials in Spanish) will grant 200 permits to vessels that offer whale watching tours. Every crewmember has been trained to offer the best possible experience to visitors without affecting the natural habitat of the whales. For a seasoned sailor like Marco, whale watching is much more than a pastime. The captain of the Isis is used to following them like an experienced hunter "although the only thing that's being fired here are the visitor's cameras" he says with a smile. The humpbacks are already here; Marco knows it and even though he is currently offering a tour to the Marietas Islands, he doesn't miss the opportunity of showing tourists this pair of whales that are visiting Bahia de Banderas. All he has to do is follow their trail. When a whale swims underwater, the movement of its tail creates turbulence in the water, which then eases off in the surface above, creating an almost perfect "footprint". "The footprint appears gradually, first here and then over there... and then a little more to the right. This is how we follow the whale wherever it goes until it comes out to the surface to breathe. It's just a matter of being patient", says Marco. There are countless spots where one can enjoy whale watching in Riviera Nayarit, from San Blas to Nuevo Vallarta, sometimes close to the coast and sometimes by following them on an authorized vessel. In San Blas and Rincon de Guayabitos it's common to find pods of young whales fighting over a female by doing spectacular leaps over the water and by clashing their bodies to impress her. In Bahia de Banderas, females protect their calves and teach them how to dive. Marco's occupation is relatively new, because even though whale watching is as old as the region itself, the touristic industry has only exploited the activity in the last 15 years. "Previously, day cruises were all about partying and drinking. If we saw any whales, it was nice as they've always offered a great show, but it wasn't until recent times that whale watching tours became a specific touristic activity", says Marco. He isn't mistaken; whales have always offered a beautiful display, especially in the waters of Bahia de Banderas, which at some point in the XVI and XVII centuries of the colonial rule was known as the Bahia del Jorobado (Humpback Bay), precisely because of the large number of whales that visit the bay during the winter. However, humpback whales aren't the only ones that visit our bay; occasionally one can find gray whales and the main predator of humpbacks: killer whales. If you're lucky enough you can come across all three species in the same trip. The reward finally comes when the mother flaps her tail on the water and then disappears for a couple of minutes. Marco tightens his lip and doesn't utter a word, as he knows what's about to happen. The mother has submerged to generate thrust and suddenly she leaps out of the water, concluding the exhibition.